Some cowboys try to cover all the bases at once. They’re trying to punch cows and get rich at the same time. I knew one enterprising cowpuncher that was day-working, hauling for hire and trading every chance he could. He had plenty of ambition and a deal working all the time. He wasn’t bashful about horning his way into any situation. The other cowboys were tired of him trying to make a dollar off of them as he sure got a charge every time he skinned one of them. His trading deals got harder to swallow but that didn’t dampen his desire any to close a deal. He wasn’t short on gall; he grabbed every chance like a tight shoe salesman. It was the beginning of the spring works and a crew had gathered at one of the larger ranches in West Texas, ready to get to work branding. The evening before the work started all were gathered around the fire to catch up on the winter news and share a little social time. This particular crew didn’t know this enterprising day worker who showed up with a load of horses and plenty of confidence. Mr. Forbes 500 smelled an opportunity and he got busy setting his trap. He started right in without any introduction. He had a horse and wanted everyone to know what a great horse this was with the color and the athletic ability and the perfect size and all the bone you would ever need; anyone could get along with him. This was a finished horse ready to go anywhere with anyone for $2500. This crew couldn’t even count that far, they had never seen a check that big. Back then, day wages were only $15 and you could buy a brand new pick-up for $2500. Mr. Horse-trader was like a hound dog barking up a tree with no squirrels in it but he never slowed up. He was convinced that he could close the deal before bed time. Several tried to outlast him hoping to get one word in before they went to bed but they all lost and Mr. All-around was still rambling about the qualities and beautiful markings on this unique equine specimen. Some of the early birds gathered before the coffee grounds had settled and were hoping to have a quiet cup before the horse trader showed up and shattered the peaceful morning. No such luck, he was there shortly after someone rattled the first coffee cup and he started in just like had left everyone the evening before. He acted like he hadn’t even slept, he picked up right where he left off. The early birds were looking for a hidey-hole and somewhere peaceful to enjoy their first cup but escape was hopeless and everyone was staring at their coffee wanting to throw it at the one man show. Everyone was crying for daylight and couldn’t even think about breakfast; trying to figure out what to do to this babbling fool. Daylight was a long time coming. It seemed as if the sun wasn’t going to come up until someone bought this horse. There was a small lull when the cook hollered ‘chuck’, but the deal was only muffled slightly between mouthfuls of biscuits and gravy. No one went back for seconds, as everyone was anxious to catch a horse and escape the boring monolog but escape was impossible. Nothing changed in the catch pen, the sales pitch continued while everyone was saddling and Mr. Wheeler Dealer was in the spotlight; holding up the show while he groomed and saddled and never missing a chance to expound on the beauty of his steed. Needless to say he had everyone’s attention when he swung aboard. It wasn’t long before they could see that this puncher could ride with the best. He was in full control and Mr. Horse couldn’t move without the trader being right with him. This critter was all horse and looking for somewhere to go but Mr. Showman still had the stage and was taking full advantage, showing off his product every chance he had. He knew all the tricks and moved his ride with the greatest of ease. But as with so many artist, he might have pushed a good thing a little too far and his ride was getting mad instead of loose. You could see the holes starting to show up in Mr. Perfect Horse. The reason this horse didn’t have a good home suddenly made itself evident as he proceeded to exploded into a full fledge mad bucking fit. But this didn’t bother our enterprising tycoon any, he went from a high pressure salesman to a RCA bronc rider. 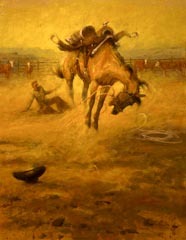 He never even tried to pull him up, instead he just threw him the slack and begged the horse to show him what he had. 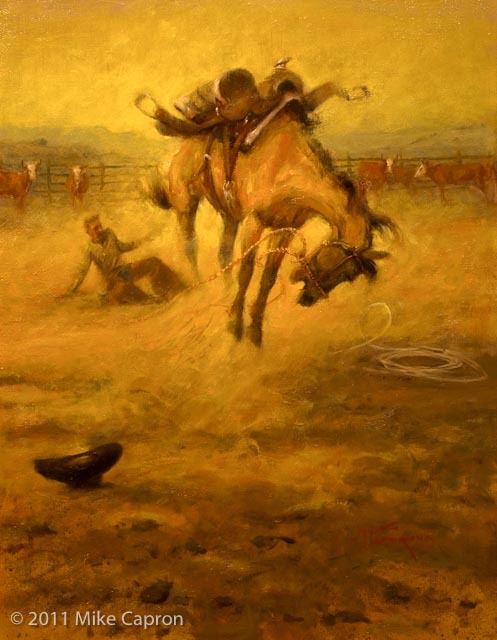 He sure was puttin’ on a show and everyone was beginning to forget about his long winded sales pitch and enjoy his riding ability,………….when “ole fooler” found another move in his bag of tricks and threw our new found champion as though he was hit with buckshot. He hit the ground and spun around on the seat of his britches with two handfuls of coral dust and hollered out, “I’ll take a thousand for him”. Comments for "He Should Have Called In Sick"